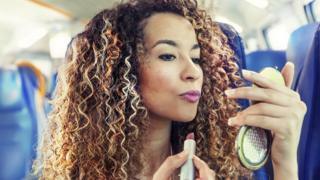 Make-up on the train: What's the problem? The answer, for many, is yes. Make-uppers featured heavily in response to reader submissions of passenger pet peeves. Michael, 59, said he was so offended by the sight he had moved carriages. "I think once or twice I just stared at the person thinking that they would eventually notice and feel embarrassed. That never happened," he said. "It's something for someone's private space - their bedroom or bathroom. So to find myself sitting on a train and then suddenly inside someone's bathroom is very unwelcome." For 60-year-old Gerard, a woman applying make-up in public is as bad-mannered as a man combing his hair in public. "Why can they not get up 10 minutes earlier and do [their make-up] at home?" he asked. "There seems to be something so totally 'in your face' about females who insist on their dubious 'rights' in this matter." Rachel Moss, owner of Shrewsbury beauty salon The Glam Studio, said men have no right to tell women what they can and can't do on the train. "What difference does it make to their journey?" the 37-year-old asked. "I can't imagine it's invading their personal space unless they have the entire contents of Boots' make-up counter on the table. "Make-up for most women is to make them feel good, to look good and being judged by men for this really isn't acceptable in 2018. "Even men like to wear make-up these days so maybe they are just jealous and would like some tips." Is it OK to paint your nails on a train? More to the point, asks PhD student Rebecca Hall, why is it anyone else's business where a woman chooses to put on her eyeliner? "The implication is that women should emerge from their homes with a complete face of make-up or else face complaints from members of the public," said the 26-year-old. "What message does it send to young girls? That they are expected to be 'on show' at all times and not once can they let the mask slip? "Societal pressures are not enabling women to be free, they are confining them... to the privacy of their bathrooms." The idea that make-up is a secret and should be applied in private is an outdated concept, says professional make-up artist Nic Chapman and one half of beauty brand, Pixiwoo. "Make-up videos are the most viewed videos on YouTube - people want to watch it. "I actually really enjoy watching other people do their make-up on the train. "I think, 'good on you'. We are not ashamed of wearing make up. Times have changed." Not for Simon Dessain, 61, who said: "Grooming is just not a suitable activity for a train, any more than leaky earphones, or bodily noises... make-up just falls into the same category of behaviour." Sarah Pennells, founder of the Savvy Woman money website, said eating "stinky food or leaving rubbish has an impact on other people in the way doing your make up doesn't". But this represents a grey area for some - the issue is not one of physicality, but hygiene, says self-confessed "germaphobe", Dilruba Khanom. "I do admire a woman's confidence to not give two hoots and slap on the face [in public] - even if people like me shudder," she says. "But can you imagine how dirty the Underground is with people's skin particles floating around? "Then you get out your make-up brush or even worse, use your fingers that you have just touched the tube handle bar with to apply make up." Applying make-up was cited by many as the perfect use of the otherwise wasted minutes spent getting from A to B. For Sarah Wadsworth, the morning train ride was "a little gift of time" between caring for her terminally ill mother, studying for a degree and volunteering as a youth worker. "Why wouldn't you grab an extra 20 minutes in bed or hang the washing out to dry before leaving the house, when you know you can do your make-up on the train without causing injury to people around you?" For Ms Chapman, it's a matter of using your time wisely, regardless of activity. "My journey into London is two hours - I'm not going to get up put my make-up on, and not spend that time with my kids - I'm going to do my make-up on the train. "It's totally acceptable, how you choose to spend your journey is your choice. I'm all for it and I'd like to see more of it."